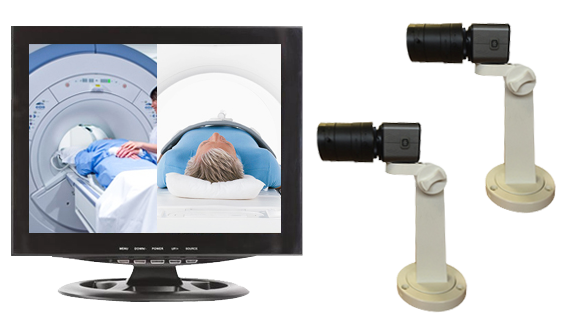 This closed-circuit TV camera package allows for visual monitoring of your patients during their scans and now features an optional integrated recording feature for high-risk patients and for security purposes. Ceiling- or wall-mounted fixed camera is unobtrusive and transmits high-quality color images in real time to the operators console where a 17" TFT LCD monitor is located. A dual camera system is also available allowing split-screen viewing by the technologists to see both the front and back sides of the magnet simultaneously. Tested and approved by GE on a 3-Tesla magnet.